Again, mostly non-Cino photos, just because they’re funny. 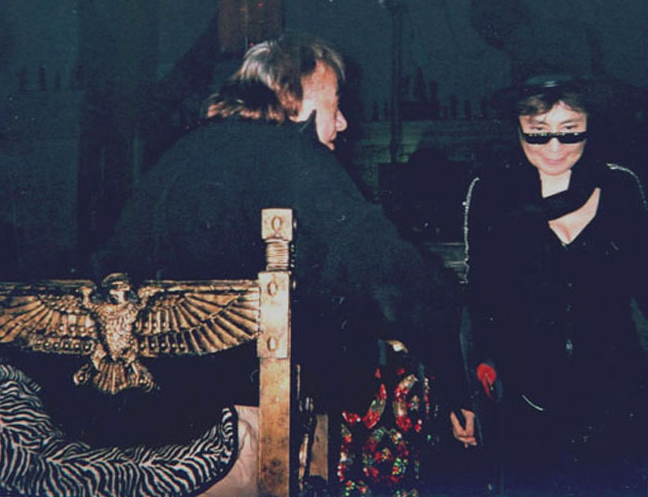 H.M. KOUTOUKAS and patron Yoko Ono at a ceremony at Judson Memorial Church, NYC, October 14, 2007, celebrating “H.M. Koutoukas’ elevation to Sinister of the Arts,” photo by DIANA MAE MUNCH. JOAN PETERS, JERRY CARUANA’s :Mannikins,” 1962. Joe Papp was a bit startled to be flash-Polaroided as he handed me my Rockefeller Grant. Tom O’Horgan’s Lamaze Class (Lamamaze?). Beth Porter says that’s she Tom is studying. Paul Boesing reads good advice for any pushcart-person in Paul Foster’s Hurrah for the Bridge. LINDA ESKENAS as TOM EYEN’s “Frustrata” for Cino at La Mama gave one of the funniest performances ever. Frustrata is Tom’s take on Barbra Streisand. Photo JAMES D. GOSSAGE. Why do gay playwrights always put their leading ladies into slips? First 3 photos JAMES D. GOSSAGE. Dignified CLARIS NELSON seems to be insisting, “All right, that’s enough of such silliness.” MARI-CLAIRE CHARBA and WILIAM M. HOFFMAN seem to disagree. You’re so interesting! I do not think I’ve truly read anything like that before. So nice to find another person with some unique thoughts on this subject. Seriously.. many thanks for starting this up. This web site is something that is required on the web, someone with a little originality! I wonder how a lot attempt you place to make the sort of wonderful informative site. “Heart of Stone,” Iko: The talk scene between Bella and Edward. der Therapie bedarf, ist die Hilfe, aber nicht wei.